“Crashes with trucks and vans are mostly caused by the driving style of the drivers.” That is not what I think, but what is stated on a site of the Dutch national Government. It is clear who the Dutch Government thinks is responsible for these crashes. 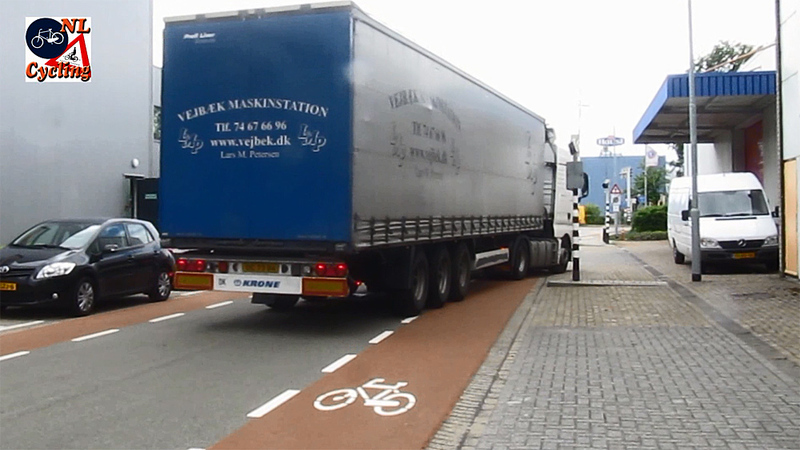 If you cycle straight-on in the Netherlands, you always have priority over turning trucks. This is the basic rule of priority. But it often happens that drivers of HGVs miss people cycling to their right (legally undertaking the truck or on a cycle path) and that can lead to a so-called “right hook” where a cyclist is crushed by the truck turning right. Because of the nature of the two road users, one with a huge mass and one who is completely unprotected, the consequences of such a crash are very severe, often deadly for the person on a bicycle. Two men on their bicycles wait for a red light while a truck driver makes a right turn. Separate green phases and separate cycling infrastructure makes this safe in the Netherlands. Other road users often do not take into account that trucks and vans are limited in seeing objects/persons near their vehicle and that they have to swerve to one side to make a turn to the other side. To teach other road users about these factors there have been national campaigns. On the site of motoring club “ANWB” we find that most of the right hook crashes (75 to 90 percent) happen right after traffic has come to a full standstill. So the crash sites are usually signalised intersections, right after the lights turned green. ANWB, representing motorists in the Netherlands, also advises to ban HGVs from urban areas and to build distribution centres at the edges to transfer freight into smaller vehicles. Utrecht has long had such a system with small electric vehicles. 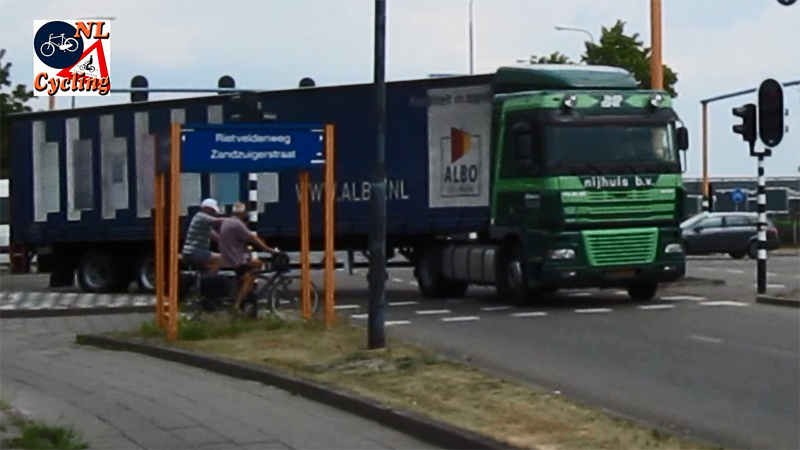 So just how bad is the situation with regard to trucks and cycling in the Netherlands? Since 2007, the figures fluctuate from 4 to 10 cycle fatalities in right hook incidents per year for the entire country. A decade earlier there were twice as many deaths. But new legislation requiring extra mirrors or cameras and a national campaign to raise awareness reduced the number of deaths considerably. 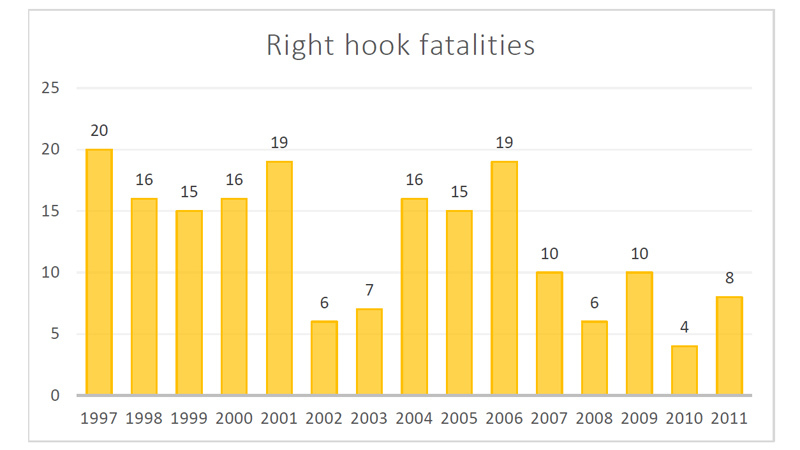 These right hook incident deaths are a small percentage of the total cycling fatalities in the Netherlands, which are around 200 per year. Considering that 5 million Dutch people cycle an average of 14 million bike journeys every working day in the Netherlands this still is a very low figure. But because the consequences of these right hook crashes are so severe, they have a considerable impact to society and this leads to a lot of attention from traffic experts. The number of cycling fatalities in right hook incidents per year for the entire country of The Netherlands. The dip in 2002/3 can be explained by the media attention new legislation (mirrors on trucks) got. This was only temporary. The decrease after 2006 can be explained by a national campaign aimed at drivers and school children to educate youth to stay out of the blind spot. This is completely in line with the Dutch policies of Sustainable Safety. These policies seek to prevent road crashes. For that reason the Dutch already try to separate vehicles with a huge difference in mass and speed on specific separated infrastructure. Well-designed infrastructure also leads to predictability of behaviour. Sharp curves in urban areas force truck drivers to take those corners at low speeds which gives people cycling time to anticipate the next ‘move’ of that truck. Separate cycle paths give people cycling also a safe place to wait for a truck driver who makes a mistake, something that is inevitable according to the same Sustainable Safety principles, for the simple reason that humans are fallible. You cannot expect every road user to always follow every rule, humans simply do not work that way. You should therefore design streets in such a way that the mistakes people make (accidental or deliberate) do not cause the deaths of themselves or others. The video shows how this all works in reality. I have collected these images over the years I have been filming. It is very strange, and hopefully a coincidence, that the only three truck drivers I ever recorded on film making mistakes all drive a truck with foreign license plates. This Danish truck driver does not indicate that he is leaving the carriageway to park. The Danish truck driver in the video unexpectedly leaves the carriageway to park while crossing a cycle lane, without indicating this direction change. I had stopped to film this lane but I could just as easily have been cycling there. Maybe indicating is not required in Denmark but I would think this is a universal rule. 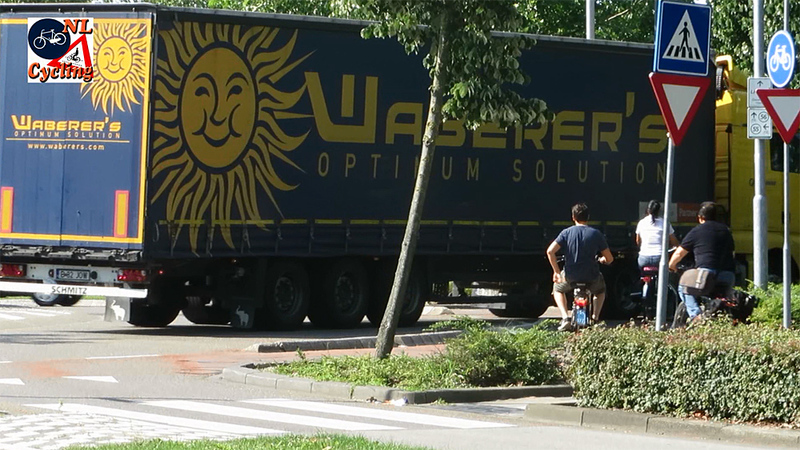 This Hungarian truck driver does not give people cycling the right of way when he leaves a roundabout. Four vulnerable road users have to wait for him to pass, but infrastructure makes this mistake -in this case- harmless. 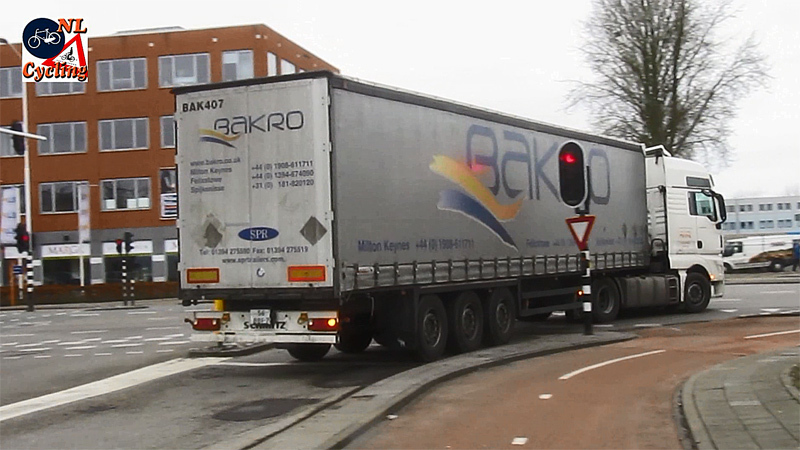 The Hungarian truck driver leaves a roundabout and should have given people cycling straight-on the right of way. The woman who approaches first sees what happens and has enough time to pull her brakes and stay on her protected cycle path to wait for the truck to pass. In the short time the truck makes the turn two other people cycling and one person on a moped also have to wait. Annoying, but no harm done. They did not have to jump for their lives because they could stay in the safety of their separated cycle path. The driver of this truck from the United Kingdom makes a turn after the light had long turned red, forcing other road users to wait longer after they already got a green light. The truck driver from the United Kingdom makes the most blatant mistake. The light had long turned red before the driver decided to simply continue his right turn. Other traffic, like the car driver approaching from the opposite direction wanting to make a left turn has to wait a bit before accelerating, but other than that, no real harm was done here. Creating an environment in which making mistakes does not lead to people’s deaths is what the Dutch are after. Modern infrastructure in the Netherlands reduces the number of dangerous interactions between different road users. Infrastructure may not always be up to the latest standards everywhere, but the figures are already a lot better than those in other countries and cities. (In London alone “nine of this year’s 14 cyclist fatalities have involved a heavy goods vehicle”). People do still die in right hook incidents and people do still get severely injured, but especially considering the high number of cycle trips that are made in this country, it would seem the Dutch approach is a good way to keep people cycling as safe as possible around trucks. Very informative post, thank you. However, the link to the Dutch government site doesn’t work (in the second sentence). Can you please update the link and help others cite this official website? I couldn’t find the exact figures for right hook accidents in particular, but out of the 12 fatal bike-lorry collisions in 2012, 7 were with elderly (60+) cyclists. Another 4 were with children between 12 and 18, likely killed on their way to/from school, judging by the times. That means that in the group of people who cycle in much of the UK and the US, men of typical commuting age (18-59), a single cyclist died in the Netherlands last year after being hit by a lorry. Bear this in mind when doing comparisons. Green-phase advantage for cyclist (as shown in the vid) is a good thing, but is still dangerous for those cyclists, who didn’t already wait at the traffic light and ride next to the lorries. It would be better, if green-phases for those who turn right and those who ride straight on would be separated entirely. Both situations exist in the Netherlands. That depends on the particular junction. Investigations show that cyclists who are stopped together with the truck are at more risk than cyclists arriving later at the junction, because those riding cyclists are not in the blind-corner. So a head start (and not of 1 second as is usual in Germany but of up to 10 seconds as is usual in the Netherlands) does make a lot of difference. Interesting stuff; i hope to some day travel to NL to experience the transport infrastructure first-hand. when you said “… miss people cycling to their right (legally undertaking the truck or on a cycle path)”; unless i am mis-interpreting what you mean, the correct term is overtaking (not undertaking). err no, the correct term is untertaking. Passing a slower vehicle on the curb side of the road. Read more here. 20 years ago when at University studying transportation and planning “the forgiving roadside” was a a huge element of design principals. Like all aspects of life today, policy and culture is to get every last drop from a resource and maximum efficiency policy now controls everything. The consequence of this policy is that simple errors instead of causing no harm now cost lives. Not one of the vehicle drivers involved in the 6 recent cycle fatalites woke up that day intending to harm anyone, however the environment they were in and the infrastructure they use determined that a simple error of judgement or moment of inattention took someones life. As an urban cyclist and a professional driver I’ve noticed that sometimes impatient cyclists create dangerous situations themselves by using the smallest cranny available just to overtake and save the minute or so it takes a van to cross an intersection or make a turn. There is a junction just around the corner at the end of my street and it’s a miracle accidents hardly ever happen there, especially in this time of year, with so many cyclists riding around without lights. The bigger your vehicle, the bigger your responsibility, but safety is joint effort. I’ve noticed that sometimes impatient drivers create dangerous situations themselves by using the smallest cranny available just to overtake and save the 10 seconds or so it takes a cyclist to cross an intersection or make a turn. There is a junction just around the corner at the end of my street and it’s a miracle accidents hardly ever happen there, especially in this time of year, with so many drivers riding around without lights. Seriously though, if you watched the video above you would see that if all our roads were all designed to Dutch standards, no one would be put in the situation where they have to choose between making progess and staying safe. There’s hardly any accidents on the junction you mentioned despite the road environment, not because of it. If I was in charge of the Dutch truck driver’s union, I’d lobby to make all foreign truck drivers deposit their containers at depots just inside the border, on the grounds that foreign truck drivers don’t know the very safe Dutch road rules perfectly. (unless they had undergone an accredited NL roads rules training course). More work for Dutch drivers! I don’t know how well the Eu would react to that. Excellent post, Mark. It seems that here in Australia, HGVs are over-represented in cyclist fatalities. The most common places for conflict are intersections, followed by totally inadequate ‘door-zone’ or ‘gutter hugging’ bicycle lanes – ‘Clayton’s Infrastructure’ if you ask me. I sorely wish the rest of the world would adopt the Sustainable Safety policies of The Netherlands and realise that it makes the world safer and more pleasant for *everyone*, regardless of travel modality. This entry was posted on 20 November 2013 by Bicycle Dutch in Original posts and tagged figures, infrastructure, sustainable safety, trucks.